In 1952, the town of Kadayanallur in Tamil Nadu, India, was gripped by a prolonged drought. And due to the high taxes on cottage industries imposed by the British, Madam Asial Beevi and Mr O.M. Abdul Kader, along with their two sons, lived in extreme poverty. "My parents decided that they had to go abroad to survive. If not, they would end their lives there," said Madam Mumtaj Bivi, 54, the late pioneers' youngest daughter. When their ship was delayed in Madras - present-day Chennai - the penniless couple had to move in and out of squats for two months. "I remember my father telling me that when he couldn't bear the hunger, he soaked his sarong and wrapped it tight around his stomach to deal with the hunger pangs," said Madam Mumtaj. When they arrived in Singapore, Mr Abdul worked as a coolie and Madam Asial started out as a cook before selling traditional curry powder at a wet market in Queenstown. Most of their earnings paid for their nine children's education, added Madam Mumtaj, a Tamil-language teacher. Her parents' tale of survival and resilience is one of 100 stories that are immortalised in a gallery. 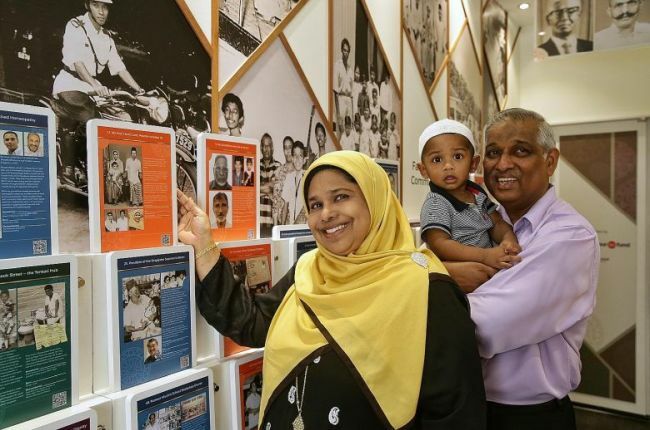 To commemorate Singapore's bicentennial, the Nagore Dargah Indian Muslim Heritage Centre in Telok Ayer launched a photo exhibition yesterday called From Singapore To Singaporeans - Pioneers And Descendants, that showcases the stories of pioneers who sailed to Singapore before 1965. The exhibition is one of more than 100 events and projects to uncover stories of the Republic's past as the country marks its bicentenary. Minister-in-charge of Muslim Affairs Masagos Zulkifli was the guest of honour at the launch. Exhibition curator Mohd Nasim and his team at the heritage centre took six months to find 100 contributors and design the gallery. The oldest pioneer highlighted is a Muslim immigrant from Bengal who was born in 1843. Mr Shaik Ismail Ballah started working as an archivist at the German Consulate General in Singapore from 1892. The free exhibition primarily showcases the Muslim community's heritage, with 23 photo essays featuring pioneers of other faiths, such as Sikhism, Taoism and the Baha'i faith. Mr Nasim, who is in his 50s, said: "I decided to make this a multicultural project because the stories of our pioneers - their similar aspirations, challenges and determination to protect their loved ones - cut across racial and religious lines." One contributor, Mr Percival Shepherdson, traced his lineage back to the 1600s, and discovered that his ancestors might have been shepherds in England. In the 1700s, his direct ancestor was a seafarer who sailed to the East and started a family in Penang. His grandfather travelled to Singapore in 1910 to find better opportunities and became the trailblazer of the Shepherdson family here. Mr Shepherdson, 72, a retiree who is proud of his Eurasian heritage, and who did not hesitate to share his story when Mr Nasim approached him, said: "I am very proud of the Shepherdson name, and that there are nearly 200 of us in Singapore." Many photo essays put the spotlight on pioneering Indian Muslims who were successful merchants, religious leaders and even politicians. Contributors from the Kadayanallur community recounted how their parents and grandparents, who worked in provision shops and wet markets, understood the importance of education and donated a portion of their modest salaries to build the first Tamil-language secondary school in South-east Asia. Madam Maimoon Abdul Razak, 67, whose late father was a supervisor at Umar Pulavar Tamil High School, said: "If the school had not been built, the children of the Kadayanallur community would not have had much education, since they would have only finished primary school." Singapore Kadayanallur Muslim League president Naseer Ghani said: "Our pioneers enhanced the community by providing better education. Many of us graduated to become Tamil-language teachers and members of the Tamil media." The exhibition will run from tomorrow until Dec 31.